Mrs. Debra E. Shapiro, DTE, the technology and engineering teacher at FGMS, was recognized on Thursday, March 28 at the International Technology and Engineering Educators Association (ITEEA) conference in Kansas City, MO for Outstanding Leadership on the ITEEA Board of Directors the past two years. Mrs. Shapiro served as the Region 1 Director, working with technology and engineering educators on the east coast of North America (United States and Canada) and the Caribbean Islands. 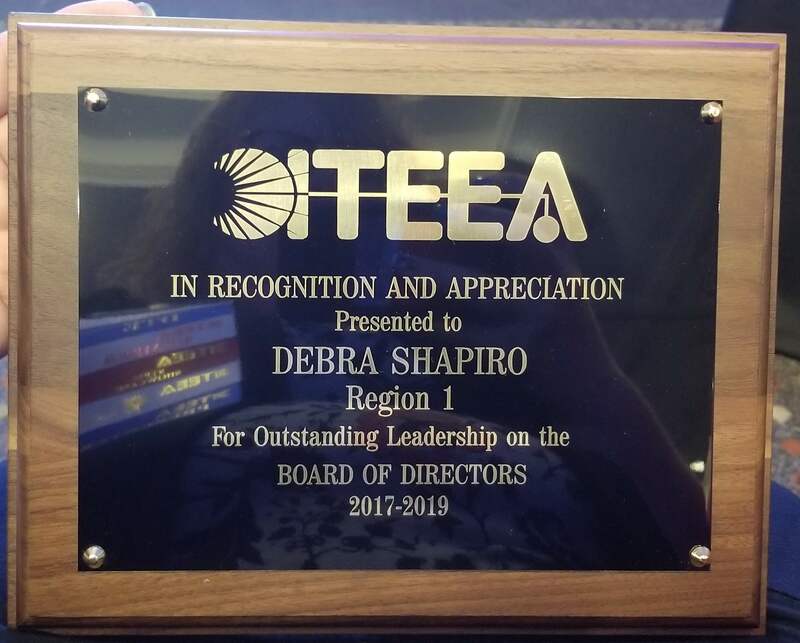 During her time as a member of the ITEEA Board of Directors, Mrs. Shapiro fulfilled her duties as assigned by the ITEEA, surveyed representatives of each of the affiliate associations to find out their needs and gather information about their state or national activities, worked with the Distinguished Technology Educator (DTE) Committee, the Awards Committee, and Co-chaired a task force to address membership needs. Mrs. Shapiro was invited to and participated in the Briefing on the Federal STEM Education 5-Year Strategic Plan and had the opportunity to provide input for the 2018 STEM Education Strategic Plan. Mrs. Shapiro was recently nominated to serve on the review team for revising the Standards of Technological Literacy. This group of educators will be working together during a workshop in August to make revisions to, update, and review the current Standards of Technological Literacy published in 2007. The project is being funded by the National Science Foundation. The Standards of Technological Literacy are the basis of all Technology and Engineering Curriculum in the Commonwealth of Virginia. Mrs. Shapiro will continue working with the ITEEA as the Co-Chair of Task Force 3, a member of the Distinguished Technology Educator and the Awards Committees. Mrs. Shapiro also is an ITEEA Authorized Teacher Effectiveness Coach for the Commonwealth of Virginia to train other middle school teachers to use the Engineering by Design Curriculum for Technological Systems and hopes to attend training for the Exploring Technology and Inventions and Innovations courses this spring. Mrs. Shapiro received a special invitation to be a member of the Teacher Leadership Team for the Engineering for All Professional Development for STEM Teachers in a project proposal that is being submitted to the National Science Foundation by Hofstra University, SUNY Stonybrook, and ITEEA who are collaborating to lead the project.